Use this image as a beginning guide to familiarize yourself with the ArcGlobe environment. Note that dockable windows can be moved around the display to customize your view. 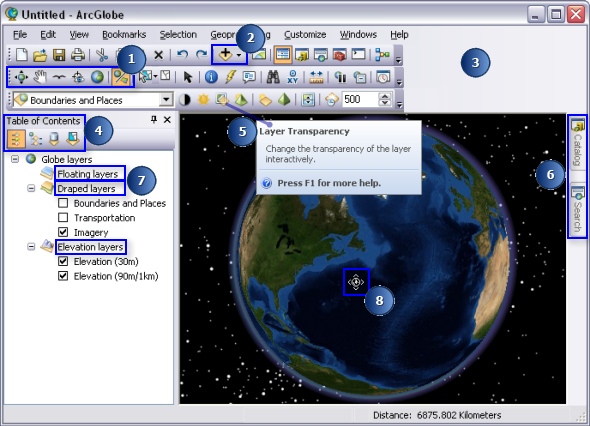 In addition, certain tools on the ArcGlobe interface may be specific to ArcGlobe and are not seen on toolbars in other applications, such as the Globe Measure and Pause Data Caching buttons. The Tools toolbar includes several navigation tools used to manipulate the observer and camera target positions. These tools optimize interaction with the 3D view and your data. Click the Add Data drop-down arrow to access other options for data resources. You can browse your data, add basemaps to the globe, or add data such as layer packages shared from ArcGIS Online. Access more toolbars to add to your view by right-clicking this gray area. You can also select/deselect toolbars from the Customize menu. The table of contents has several ways of listing layers: by type, source, group layers, or whether layers are selectable. List By Type is the default view for ArcGlobe and is similar to List By Drawing Order in ArcScene and ArcMap. ToolTips are revealed when you pause the pointer over a tool on a toolbar. You can quickly learn the name and more about its capabilities. Dockable window controls collapse from the 3D view when not in use. Click a tab to expand. In ArcGlobe, you can add your data to different display categories depending on how you want it to behave in the 3D view. The navigation icon. This changes as you use different navigation tools to move around the globe and your data. Can your system run ArcGlobe?